NSCA, the leading not-for-profit association representing the commercial low-voltage electronic systems industry, has released updated Labor Installation Standard guidelines, providing information that systems integrators can use to accurately estimate labor units – the biggest factor impacting project profitability. As the result of a thorough, months-long peer review by a team of experts from around the country, the new guidelines detail the amount of time it takes to complete project-related tasks, factoring in time spent on material handling, examining drawings/layouts, and equipment installation. For each technology system, labor units are provided in three different levels – normal, difficult, and challenging – so they can be adjusted based on project difficulty (higher ceiling heights, for example), installer experience, and/or site conditions. The report also includes installation data on new technology platforms and systems prevalent in the market since the last report update, and adjusts labor hours for existing technology systems based on current installation methods and efficiencies. 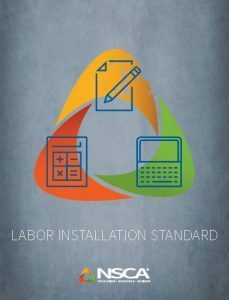 The NSCA Labor Installation Standards guidelines are free to download for Gold and Platinum NSCA members. Silver and Bronze NSCA members can download a copy for $199. The report can be purchased by non-members for $399. Or non-members can become NSCA members for only $595 and receive the report as part of their membership, which offers access to discounted education and training opportunities, updates on regional and national government affairs issues, free monthly industry webinars, business tools and resources, and other exclusive industry research. For more information about the NSCA Labor Installation Standards, or to join NSCA, visit www.nsca.org or call (800) 446-6722. The National Systems Contractors Association (NSCA) is the leading not-for-profit association representing the commercial low-voltage electronic systems industry. NSCA is a powerful advocate for all who work within the low-voltage industry, including systems contractors/integrators, product manufacturers, consultants, sales representatives, architects, specifying engineers, and other allied professionals. NSCA is dedicated to serving its contractor members and all channel stakeholders through advocacy, education, member services, and networking designed to improve business performance. For more information, visit www.nsca.org.